Once a month people who are 60 years and over gather to share a 2 course meal subsidised by the Aotea Family Support Group with funding from Auckland Council (Great Barrier Local Board). The meals alternate between different clubs, but are usually at the Great Barrier Island Sports & Social Club and Barrier Social Club. Occasionally they are held at Great Barrier Lodge and Motairehe Marae and may be held at the Port FitzRoy Boating Club. Buses are also subsidised to transport people to the meals. Every December there is a Christmas luncheon and every June there is a Mid-Winter Christmas luncheon. 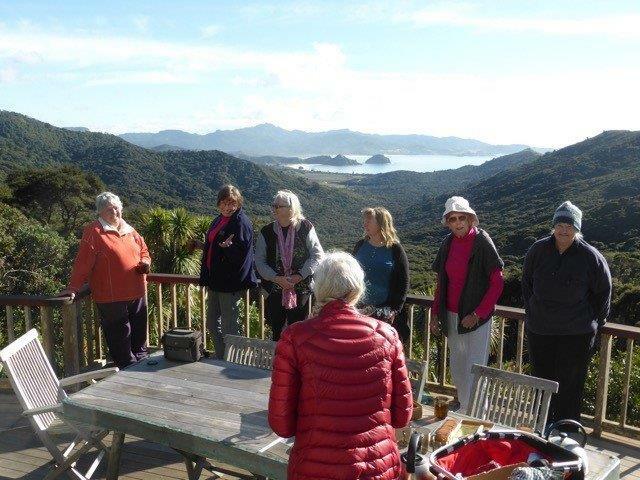 The Seniors Activity Group it is a group of seniors who meet monthly to visit different places on the Island for morning tea and a shared picnic lunch. The group is hosted by John Garlick who kindly donates his time for this and he also drives the Southern van. Hope Munro will be driving the Northern van. We would love to see you attend any/all of these events. Each month on your meal invitation I will put a notification of that month’s event. Just call the booking number, 962 to book your place. Every term break the Support Group runs a two week action packed programme of activities for younger and older children with many of the physical outdoors activities that are possible on the island. Once or twice a year we organise a weekend workshop for young parents with an off-island facilitator. The Support Group regularly organises and facilitates workshops, courses and training on the Island. Run by the community for the community – An opportunity to support local and off island businesses, raise money for AFSG, as well as providing a fabulous day out for all the family. This iconic annual event has been raising money for local community charities for over 70 yrs. As well as a family day out, the picnic provides the opportunity for local and off-island businesses to advertise and sell their products to both locals and visitors alike. The AFSG Charitable Trust has had the pleasure of organising this event since 1996. The Trust has been operating since 1988 and assists the community in a multitude of ways such as; providing home help for the elderly, new mothers and those recovering from illness; counseling services, Youth Group and School Holiday programmes, adult education workshops as well as maintaining a vehicle for community use. This event is the most attended event of the Barrier Island year. It would not be possible without the help and support of local people and businesses, as well as those who have a connection to the Barrier via business, family, and friends or by being a regular visitor to the island.